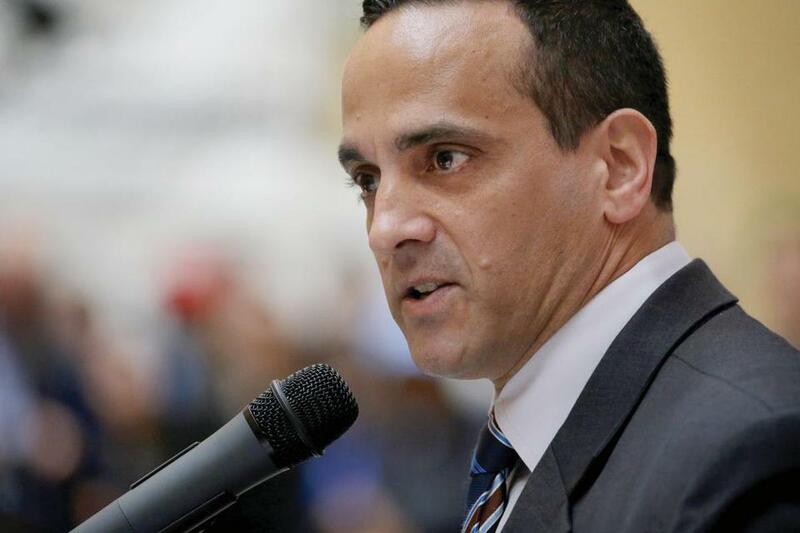 Somerville Mayor Joseph Curtatone announced Wednesday that he had fired Detective Dante DiFronzo. A veteran police detective accused of helping a purported drug dealer find a rival, who was then robbed and nearly stabbed to death, no longer works for the department, Somerville Mayor Joseph Curtatone said Wednesday. City officials declined to discuss the terms of the detective’s departure. Detective Dante DiFronzo’s lawyer said he was dismissed Monday from the department following a disciplinary hearing that examined his actions three years ago, when DiFronzo’s street source and an accomplice allegedly stormed into the home of a man accused of stealing the street source’s marijuana and assaulted him. Timothy Burke, DiFronzo’s lawyer, said the dismissal followed a biased hearing process presided over by a lawyer who was hired by the city. Burke said DiFronzo would appeal the dismissal to an arbitrator, who will be picked by both DiFronzo and city officials. “We certainly do and will have input into the selection of a neutral and objective fact-finder through the arbitration process,” Burke said. On March 2, 2015, DiFronzo’s street source, Jonathan Machado, allegedly threatened one man in the home with a machete while his accomplice stabbed Machado’s rival eight times and left him bleeding on the living room floor, according to internal city documents obtained by the Globe through a public records request. Machado was indicted May 3 in Middlesex Superior Court on charges of home invasion, armed robbery, and assault and battery. DiFronzo had been on paid administrative leave since September 2016, when city officials said they learned from Middlesex prosecutors that DiFronzo and Machado shared texts about how to find Machado’s rival the day before the stabbing. Burke said the department targeted DiFronzo, a 10-year veteran of the force and a 44-year-old father of three who had no disciplinary record and had twice been named officer of the year. Burke said DiFronzo frequently had complained to “anybody who would listen” about what he saw as the city’s pattern of promoting officers with serious disciplinary infractions. “It’s important to point out that . . . Detective DiFronzo has been an outspoken critic of actions taken and not taken by the Somerville Police Department regarding misconduct by other officers who were either family, friends, or favored members of the department,” Burke said. Burke said that DiFronzo wrote to Attorney General Maura Healey’s office in December 2017 about attempts to promote a sergeant to lieutenant even as he was facing a criminal investigation. Healey’s office told DiFronzo they would be unable to look into his allegations because of a “lack of investigative resources,” Burke said. The investigation into DiFronzo raised questions about the often-murky relationship between officers and street informants, whom police are encouraged to cultivate to help solve crimes and who are often criminals themselves. DiFronzo said he told Machado not to hurt his rival, whom DiFronzo had been trying to track because the detective suspected he had been involved in a home invasion.